Standard Water Wiggler® - Zona Fountains, Inc. The Water Wiggler® features a unique agitator action that creates continuous ripples that help prevent the spread of West Nile Virus by eliminating stagnant water in bird baths. 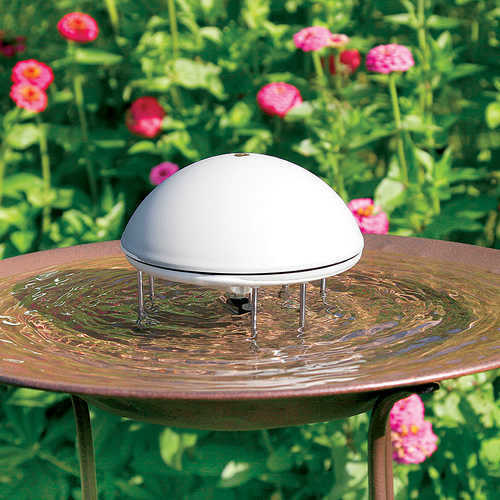 The Water Wiggler is easy to install…just place it in your bird bath and let it work! The moving water created by the Water Wiggler® will help attract birds to your bath, while preventing mosquitos from breeding in the water. There is no wiring and no plumbing. It operates on two D-cell batteries (not included) for up to two months of continuous use under normal conditions, and is completely silent. Can be used in your heated bird bath in the winter, too. Patented. One year warranty.